Betty Annan is the Country Director for Ghana. She plays a key role in country strategy formulation, government engagement and policy dialogue, and collaboration with WCF member companies and other stakeholders on the ground in Ghana. Betty has worked for the past 10 years on agriculture and rural development in West Africa, including as the Ghana Country Manager for Fairtrade Africa, Ghana Country Manager for Agribusiness Systems International, and Project Coordinator and Social Development Advisor for Care International on their West African Fair Fruits Project. 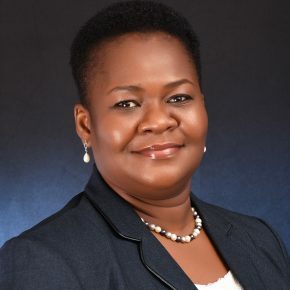 She brings strong understanding of agricultural value chains and agribusiness development, technical knowledge of environmental and social dimensions of natural resource management, good policy analysis and research experience, excellent client engagement skills, and a broad understanding of and network of contacts in the cocoa sector. Betty holds a PhD in Environmental Science from Florida Agricultural and Mechanical University in the US; a MSc in Natural Resources from University of Greenwich in UK; and a BSC in Agriculture from Kwame Nkrumah University of Science and Technology in Ghana.